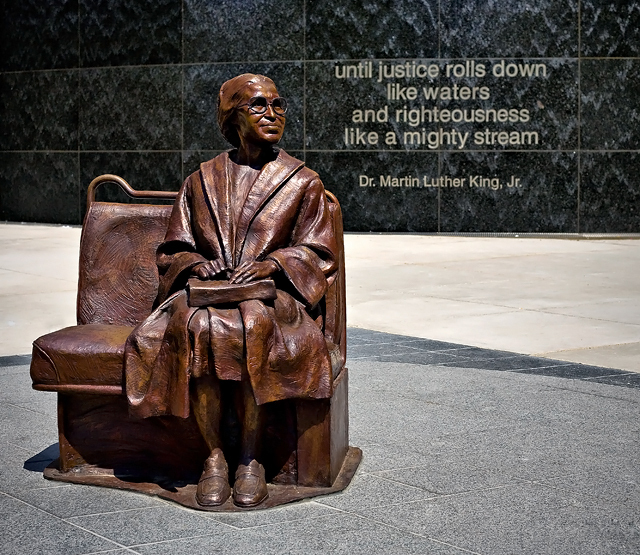 This Rosa Parks statue was installed in 2009 in a new Rosa Parks Plaza, a transportation hub for buses and light rail in the Dallas West End, near Dealy Plaza. There is room on the bench for commuters to sit with Rosa for a while, and they do. Behind her is a waterfall cascading down a granite wall with a Martin Luther King quote, “ until justice roll down like waters and righteousness like a mighty stream.” Joyce Foreman, the former Dallas Area Rapid Transit BoD member who pushed for the memorial said, “Being an African American woman and an activist, and trying to make sure that people are heard, when you think of people like Rosa Parks, you think that she sat down to be able to stand up for a position. “It is so important for young people to understand that one person can make a difference if they’re doing the right things toward that objective.” This is the second casting of this sculpture; the first is in the Rosa Parks Museum in Montgomery, Alabama.